I was able to sneak away for half the day this past Saturday and go up to Oak Creek, near Sedona, AZ. Oak Creek is a beautiful place to fish, but can be difficult. This time of year the water is low and clear, and even the stocked rainbows can be wary. 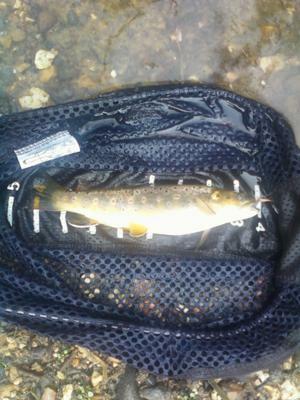 It was my first time fishing there since I have been fishing tenkara, and it was perfectly suited to this small stream. With my 12' Iwana and a size 14 black foam beetle, I was able to get the first fish of the day on about my fifth cast. Being able to keep the line off the water and out of the current, I could keep the beetle near the far bank until a small wild brown hit it. Moving upstream I found a slow pool with a few more wild browns, and three of them took a tan sakasa kebrari with a peacock ice collar. With about an hour left before I had to head back down the hill to Phoenix, I drove to the West Fork of Oak Creek and fished just upstream of the confluence on Oak Creek. I found a few pools in a row with some stocked rainbows in them. 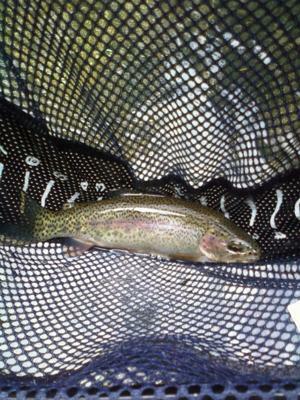 In the 20 minutes I had left to fish before I had to head home, I landed 2 rainbows and hooked and lost another 6. 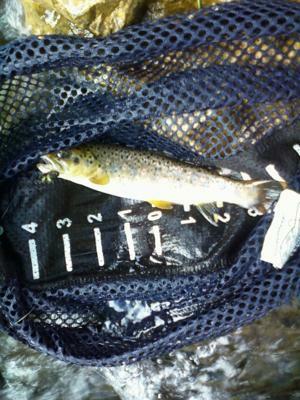 This was by far my best day on Oak Creek, and I really think I have the tenkara rod to thank. I was able to keep the fly where I wanted it, and manipulate it according to what the fish wanted. I don't think I would have caught the six trout I did with a regular fly rod and heavy line. I love fishing this way. "I was able to keep the fly where I wanted it, and manipulate it according to what the fish wanted." 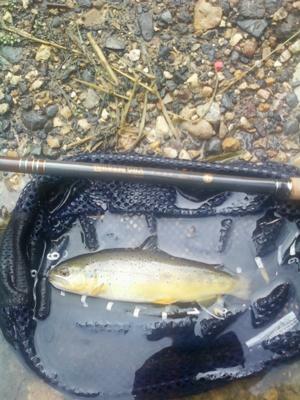 That's what tenkara is all about, and the advantage it gives you over a regular fly rod. To have your best day on that stream when the water was low and clear really shows that short casts aren't really a limitation. You must have been pretty stealthy, though. Nicely done. One more thing. I saw on your site a month or so ago the post about hip waders. When my chest waders started leaking this past spring, instead of replacing them I bought some hippers. I used them for the first time on this past weekend's trip to Oak Creek. I can't believe I never used these before! Chest waders are nice, but for the small streams I fish I never have to go more than knee deep if I don't want to. I love these hippers. I guess wearing chest waders and going knee deep is kind of like fishing a small stream with 90' of fly line on a reel...pretty pointless.